DEparture Lounge returns to locations in and around Derby Theatre for the latest summer festival full of fresh and exciting performances. It takes place from July 21-24 and it is back for its fourth year. It is presented by In Good Company, a professional development programme for artists making work in the East Midlands. The festival will again see Derby Theatre transformed into a lush garden stage, a festival site where audiences and artists alike can see the very best in contemporary performance, support regional artists to take flight and get involved in lots of inspiring workshops and discussions. Performance highlights will include: Clothes Swap Theatre Party, a DEparture Lounge premiere, a fun-filled, fashion focused piece of theatre full of fizz by Forward Theatre, an interactive piece that involves audience participation and actual clothes swapping - audience members should bring along a bag of old clothes to swap them at the event; All of Me by multi award-winning artist Caroline Horton, a trashy and funny play about a who woman who thinks about dying – a lot; I, Myself & Me by Rachael Young, a poignant piece of theatre (pictured) which explores our fascination with coupling and those living with single status shame; How Not to Live in Suburbia by Annie Siddons, a brutal, hilarious and poignant show about a single mother, artist and proud urbanite dealing with accidentally finding herself living life in the suburbs; Tanja by Strawberry Blonde Curls, an impassioned call to arms, a play and a campaign around the subject of asylum seekers; and A House Repeated by Seth Kreibel, a unique interactive performance game which explores imagined buildings without leaving your seat. DEparture Lounge 2016 will feature and celebrate more work from local artists than ever before, artists which have received a tremendous amount of support from venues and organisations in the region. The amount and quality of work being produced and presented by these artists and companies is a testament to the talent and creativity in the East Midlands, something we are incredibly proud of. Work-in-progress and performance pieces by Associate Companies (past and present) include: BODIY by Milk Presents, a brash piece of performance fusing neo-cabaret and new writing which shamelessly samples from history, literature and LGTBQ trailblazers past and present to ask – can you have it all? ; The Little Love Cabaret by Spiltmilk Dance, a scrapbook of love stories from across the UK, from ultimate heartthrobs to grand gestures of love; The Party’s Over by Nonsuch Theatre, a quirky piece of theatre which sees five individuals thrust together in a shack far away from home, sharing their stories surrounded by sand and deserted by reality; A Guide to Running Away by Impulse Collective, a dark comedy of a step by step guide to running away to the circus; Desperados by LaPelle’s Factory and The Moon & Me by Eggbox Collective. Derbados is back! Which, for 2016, will see the Derby Theatre car park transformed into a wonderful woodland retreat, complete with Romany wagon. Pitching up in this festival location will be The Barrowman, a wandering storyteller who brings magical tales to life using a rich mixture of puppetry and song, with Jessie & The Cloud Machine, the story of a little girl who lives up in the clouds, and her struggle against the great machine that comes to take all the clouds away. 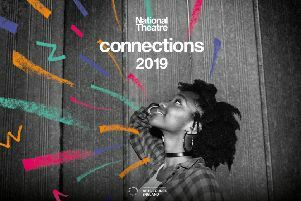 This event will include work from comedy visual company Uncanny Theatre, intricate storytellers Mashi Theatre and Derby Theatre’s Resident Assistant Director, Lekan Lawal. There will also be key note speeches from Caroline Horton (multi award-winning artist based in Birmingham); Madani Younis (artistic director, Bush Theatre), David Jubb (artistic director, Battersea Arts Centre) and Emily Howlett (PAD Productions); Playwriting workshop with award-winning playwright Evan Placey; Puppetry Workshop with Edward Wren and Giving Audiences Agency, a workshop focused on audience agency and collaboration hosted by interactive theatre-makers Coney.